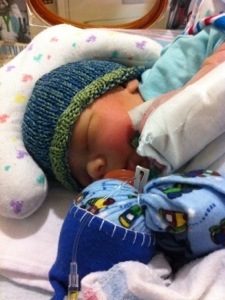 Colten’s surgery was at 7:30 AM today. 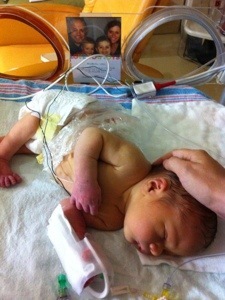 Prior to surgery I was able to hold him for short while, then the IV on his head had to get removed due to malfunction. It was replaced by another one in his hand. Apparently with little ones, IVs don’t often last longer than a day because the kids tend to mess with them so much; sometimes they’ll only last a few hours before needing a replacement. So they took Colten back around 6:45/7:00 AM – we traveled with him back to pre-op until they took him to the OR. We were expecting him to be gone for 6-8 hours. At 8:45 AM we received a call that he was stable and surgery had started (not sure exactly what time they had started the actual surgery). This first part was expected to last 3-4 hours according to the one neurosurgeon yesterday. About an hour later we got a call saying the neurosurgeon was done and plastic surgery was going to get started on closing him up. Around 11:30 AM, the plastic surgeon, Dr. Kasten, came up to let us know he was all done. So the surgery went MUCH quicker than we anticipated and all went well. Bonus bonus! The external sac was the largest one the neurosurgery team had seen before, yet once they got through the outside tissues, the actual opening was pretty standard. The area of defect has been determined at about L3 (lumbar 3). I’ll write more on the clinical issues related to that when I find my chart. During surgery, in order to help close up the opening, the team has to pretty much finish folding in the spine around itself and making sure the nerves and meninges are back in place. Then the pediatric plastic surgeons step in to seal the hole. They do this by pulling some lower back muscle from each side of the spine and overlapping it, sometimes including some muscle from the glutes. Because of the size of Colten’s sac, the plastic surgeon had plenty of skin to use – even cut off some usable skin because there was so much. All the meninges that had grown outside in the sac was removed – it’s not needed and not viable. Now that surgery is over, Colten is hooked up to an IV, a catheter, a port drain near the surgical site, and a variety of monitors/leads (heart rate, blood pressure, oxygen, respiratory rate). It makes picking up your child very cumbersome and requires a nurse to assist. This is very hard on us – we just want to grab him up and enjoy him. However, he also has strict recovery orders and must remain side-lying only, must remain perfectly horizontal, and must keep a blanket between his legs to help support his hips. He will not be allowed to back-lie for three (3) weeks. If he goes home before that time, we will be provided with a special carseat-bed to take him home in so he can remain side-lying. In terms of Colten’s physical responses, we started on October 3 with only right-quad movement and nothing else in the legs. 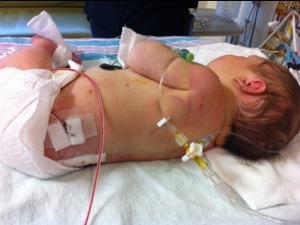 On October 4, Colten showed signs of response in both quads but nothing below the knees. We have a clear understanding from our research and from the doctors that any spinal surgery now and down the road (as he will need more over time) will often cause some additional damage. It’s just the reality of this type of surgery. So after surgery today, it did not surprise us when we were back to no quad response on either leg. By the end of today though, the neurosurgeon apparently pissed Colten off enough that he was able to get a response on his quads again. So that is promising. Still nothing below the knees, as we expected. Surgery on kids with spina bifida will never make better the damage that is done to the nerves. It only carries risk for further damage. Thank you to all of you that have reached out to us in one way or another. The outpouring of support, thoughts, prayers and offers to help are incredibly comforting. Thank you for coming along on our adventure! My above comment was supposed to go on the “Onto Recover” post, so I put it over there now, but don’t know how to delete this one. Therefore, I will add another! I knew you were both staying somewhere, but did not realize it was the Ronald McDonald House. So glad those provisions were made for you. what a sweet baby. All of you are in my thoughts and prayers.